“Whiter than white:” How Does It Work? Read other entries in the How Does It Work series. Many a laundry detergent commercial claims to leave your clothes “whiter than white.” What in the heck does that mean, how is it even possible, and how does it work? Clothes naturally begin to yellow over time. To make clothes appear whiter, the yellow tinge needs to be overcome. Laundry detergent manufacturers have tackled this problem by adding an additive to detergent which absorbs into the fabric and remains absorbed after the laundry is finished. This additive is called an ‘optical brightener‘ and is the magic behind how “whiter than white” works. There are many molecules that act as optical brighteners and that have been used in laundry detergents. They all act in the same way. They fluoresce. They absorb UV light and emit blue light. This achieves two goals. The blue light helps cancel out the yellow tinge and tricks the eye into thinking the clothes are more white than they really are. It also makes it possible for the clothing to emit more visible light than is being shined on it, making it appear brighter and whiter. Optical brighteners cause clothing to stand out in night vision goggles. 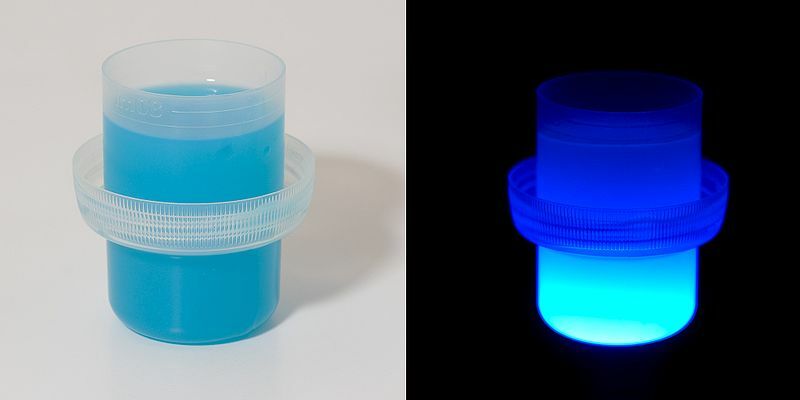 If you’re trying not to be spotted by night vision goggles, like in military applications or extreme paint-balling, optical brighteners in your laundry detergent is a bad thing. Paper is also treated with optical brighteners to make dazzling-white paper. Currency is not made with paper treated with optical brighteners. Checking for fluorescence is one way to check for counterfeit currency. If the money fluoresces, it’s probably fake. This is not how teeth whiteners work (I wouldn’t really want to put too much optical brightener in my mouth anyway). Teeth whiteners typically contain a gel composed of carbamide peroxide, a urea/hydrogen peroxide adduct. This gel is approximately 1/3 the strength of a solution of pure hydrogen peroxide. Most teeth whiteners contain approximately a 10-15% carbamide peroxide solution – equating to about a 3-5% solution of hydrogen peroxide. The peroxide penetrates into the enamel and oxidizes stains, removing the coloring from teeth. I remember my photochemistry professor saying they also used to use azulene for this effect. Yes, you are right about the teeth whitener, and I have seen a few people who seem to have over done it and almost glow even without the black light! I played with OBA years ago when I was manufacturing laundry powders. Used to dissolve in water and paint/spray on ourselves before going to a dance club. Under the UV light it looked awesome. Well I’m in a different trade now and wondering if I mix this (ratio?) with a clear modified acrylic how long will the luminescence last? What’s up,I check your blog named ““Whiter than white:” How Does It Work? – Chemistry Blog” on a regular basis.Your story-telling style is awesome, keep it up! And you can look our website about powerful love spells. You mean there are many compounds, not molecules. As a chem prof, I despise the usage of “molecule” when “compound” is meant. It’s analogous to using “soldier” when “battalion” is meant.